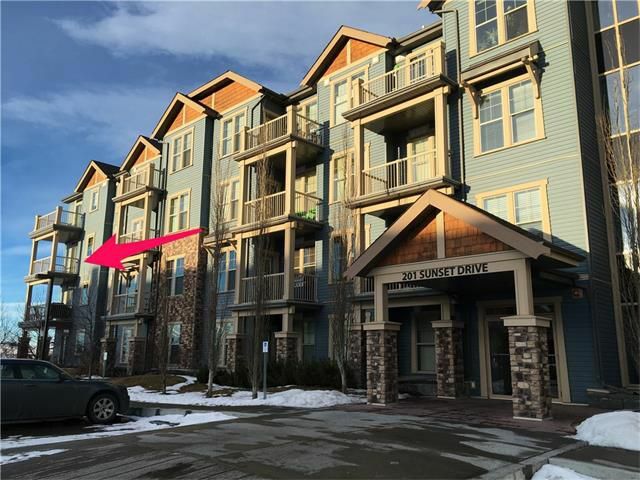 MAJESTIC MOUNTAIN VIEWS from this upscale 2 bedrm executive condo in beautiful Cochrane, Alberta. Enjoy a premium lifestyle in this immaculate SW corner suite, which offers a spacious open concept layout, and a chef's kitchen that features rich maple cabinetry, upper end stainless steel appliances, and exquisite granite counters that grace both the main cabinets & centre island. The open living/dining concept is perfect for entertaining guests, and a spacious master bedrm w/ walk in closet & ensuite w/ oversize shower invites you to retreat for the day. There is a 2nd guest bedrm & full 4 pce bath, as well as a computer alcove that is neatly tucked out of the way. High end (hardwood look) plank vinyl flooring and fresh paint in a light neutral colour exude a touch of class. Enjoy BBQ's & views galore on your private deck w/ gas hook up. Boasting 2 titled parking stalls, private caged storage, and in-suite laundry, this property is the ideal home to get away from it all. Book your private viewing today.